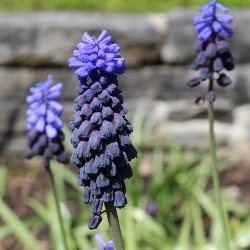 Muscari (Grape Hyacinths) have delicate spires of clustered flowers and are among the easiest of bulbs to grow. They are typically blue, but also come in bi-colors and white. 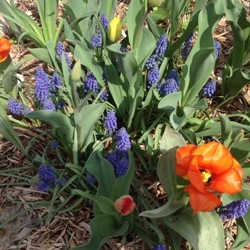 Grow Muscari in masses for splashes of color. They are extremely good naturalizers and can be forced for indoor flowering. Plant under Tulips and Daffodils for a spectacular show in the spring. Use to underplant Daffodils and Tulips. 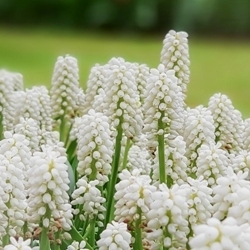 Our selection of Muscari contains 25 each of Armeniacum, Album and Latifolium. Individually packaged and labeled. M. Botryoides ‘Album’ Muscari are sparkling white. They will lighten any garden and be a great addition to the Moon Garden. Naturalize well. M. Armeniacum ‘Common Grape Hyacinth’ have tight spikes of fragrant cobalt-blue flowers with whitish rims. Prolific naturalizer. 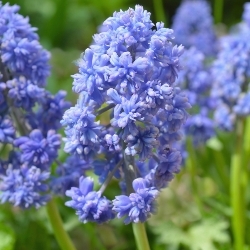 ‘Fantasy Creation’ Grape Hyacinths are double-flowering armeniacum muscari which look like small heads of broccoli. The flower starts out blue but becomes green as it fades. It stays in bloom for several weeks. Latifolium Muscari, with bi-colored flowers, dark blue at the base and lighter blue tops, provide a striking contrast in the garden. Produces a single broad leaf. 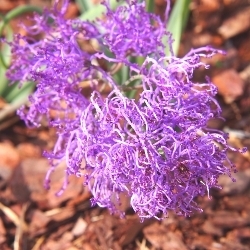 M. Cumosum Comosom ‘Plumosum’ is called the ‘Feather Hyacinth’ for its loose plume of feathery violet branch-like flowers. It’s the tallest species in the grape hyacinth genus, sometimes exceeding 12” in height. Good for cutting or forcing.